The Wizcom QuickLink pen is is a small battery operated, hand held device that digitally captures text-based information from printed documents. Instead of typing the portion of the text that you want to save, this portable device can do it for you. 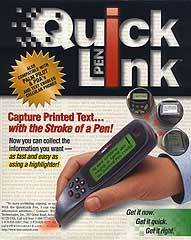 The QuickLink pen scanner is attached to your PC via a serial cable, or wirelessly to your Palm via "Beaming". I feel that the Palm connectivity is a very powerful feature, since the only data entry options for Palm users are Grafitti or using a collapsible keyboard. Using the Wizcom QuickLink, you will be immediately impressed by its ergonomics. The unit is well balanced and easy to operate. Unfortunately, the QuickLink made about one mistake per line of text (50 character lines), forcing me to either spellcheck or manually correct the data. I might be able to achieve better accuracy with practice, but I noticed right away that this is a labor intensive data entry method. I decided to try the QuickLink to "type in" e-mail addresses from business cards. Unfortunately, it is quite sensitive to background patterns and images on business cards and sometimes it made several mistakes on a single e-mail address. Since e-mail addresses can't be spellchecked easily, you are required to manually verify and correct the address and this doesn't save any time. Be more accurate or give me feedback -- I can't tell why one scan is nearly perfect, while another scan of the exact same line is horrible with more than 20% errors. While business card scanners aren't portable, their accuracy rate, several years ago, was than one error per card and larger text was recognized. With greater processing power, the QuickLink pen could be a valuable mobile device. As it stands, you will need to learn how to scan accurately or end up having to correct the results. The QuickLink device excels in battery management and has little or no power drain when off. I know this may sound silly, but most PDAs can completely discharge new batteries, within a month, just by sitting on a shelf in the "Off" position and your data is lost. I recommend this device to you ONLY if you have the patience to scan in text, line by line, and either don't want to or can't type in the text with a keyboard.